The Albany landfill is running out of space. And by the time it does -- sometime in 2022, there will be no extensions this time -- the city will need to have a plan in place for what to do with its trash. Toward that end, the city has a series of public meetings lined up over the next month to discuss the topic. Press release blurbage: "These events are designed to give residents the opportunity to meet with City of Albany Department of General Services officials, obtain information regarding the current state of solid waste management in the City, and to provide input on the next steps of the City's Solid Waste Management Plan." The schedule is below. The first event is this Wednesday, May 24. This might seem like a wonky topic, but the city is probably facing some significant changes from the current situation. The days of basically piling as much garbage as you want at the curb will be ending, and the city will almost certainly be switching to some sort of system in which people pay by the bag or container ("pay as you throw"), along with greater incentives to recycle and compost. This has all been a long time coming. Each meeting is from 6-7:30 pm. We've been kicking the can down the road for way too long. While change is often difficult, this management by crisis adds to the collective anxiety. 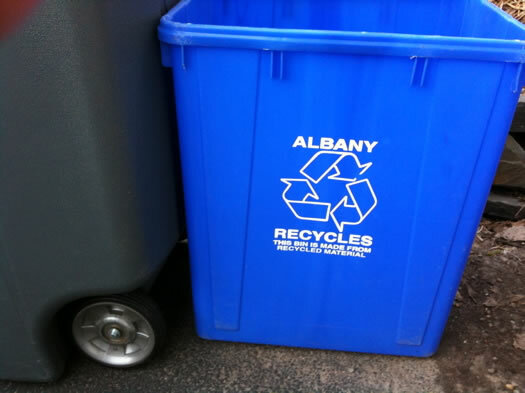 Albany is behind other cities, especially those on the left coast, to routinely incorporate recycling and composting at each and every trash can---aside from the habits of the residents, success will be measured by buy in from the business community. Everyone from supermarkets to office workers should be modifying their habits, reducing excess packaging, opting for recycleable or compostable supplies (OGS food vendors now use "plastic" utensils that are compostable---because they are made from vegetable oils rather than petrochemicals. small step. Super jealous of our neighboring streets that are part of the new recycling pilot. We often hit our three bins full! Would love a big ol' can! @Melissa: Yeah, I keep meaning to find out if we can get one of the new recycling totes even though we don't live on one of the pilot streets. Our recycling is usually overflowing our regular bin. I also like that the new totes have a lid. Who doesn't love some good ol' trash talk? While a fine activity, the production of compost is far from the best use of organic materials. The best use is using it in an anaerobic digester. That produces methane (the main component of natural gas), plus compost. The compost can be used like any compost. The methane can be used to produce electricity, or to drive buses, cars, or trucks. Germany and other northern European nations are miles ahead of us on this. Several cities there run their municipal bus systems on the methane from municipal garbage. Germany produces a large portion of its electricity from municipal garbage. Anaerobic digestion is carbon neutral, sometimes, even carbon negative. It produces energy with no fossil fuels or greenhouse gases. Further, it solves a large portion of the problems caused by landfills. What gives America? Why are we so far behind that Americans are not even familiar with this advanced technology? Gregg, I am genuinely curious why we'd want to burn methane, which is one of the worst greenhouse gasses. Gary - burning methane is a good idea because releasing it directly into atmosphere would make it act as a greenhouse gas. @Gary - composting creates varying ratios of CO2 and methane, depending on inputs and conditions. So if your compost is producing methane already, better to capture and use it. And even if you're not producing methane, digesting simply provides an intermediate step of methane production, before combustion of said methane results in the release of the same amount of CO2 as would otherwise be released. Digest & capture does not release methane to the atmosphere, which is the concern, not combustion of methane. Either way, it's basically free energy at no additional greenhouse gas cost. Ed and Mike: thanks, i wasn't clear on that. Composting is essentially what is being done when the dump is covered and the methane is flared or in some cases used to fuel an electric generator. The easily digestible products such as food waste can be run through a digester to create methane but that is a limited fuel stream and digesters can be challenging to operate. Block - major is a strange word.. US electricity consumption corresponds to about 5 pounds of fuel a day per person. I doubt I send even a pound of burnable waste to landfill a day - and food waste has much less energy content than fuel or oil.